That's you Ashley Newell!!! Congrats! 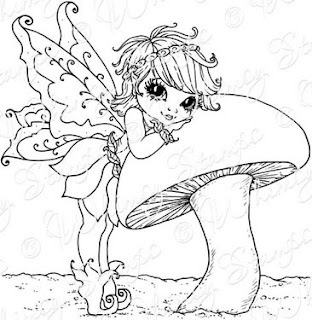 email us at Lora at onecrazystamper dot com to claim your prize, a YOUR NEXT STAMP PRIZE PACK! Thanks so much to all who joined in this month. We LOVED seeing your gorgeous artwork! Please check back tomorrow for our OCTOBER CHALLENGE and lots of inspiration. 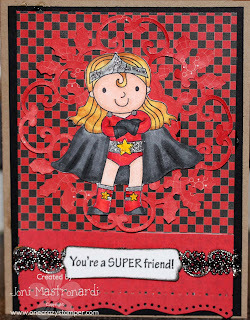 It's Super Hero Ellie, another new release from Your Next Stamp available at One Crazy Stamper! I stamped her with Memento Tuxedo black ink unto Xpress It card stock. onto a Spellbinders Holly Motifs die. I added silver glitter to her belt and headband. I also added a black and silver trim. 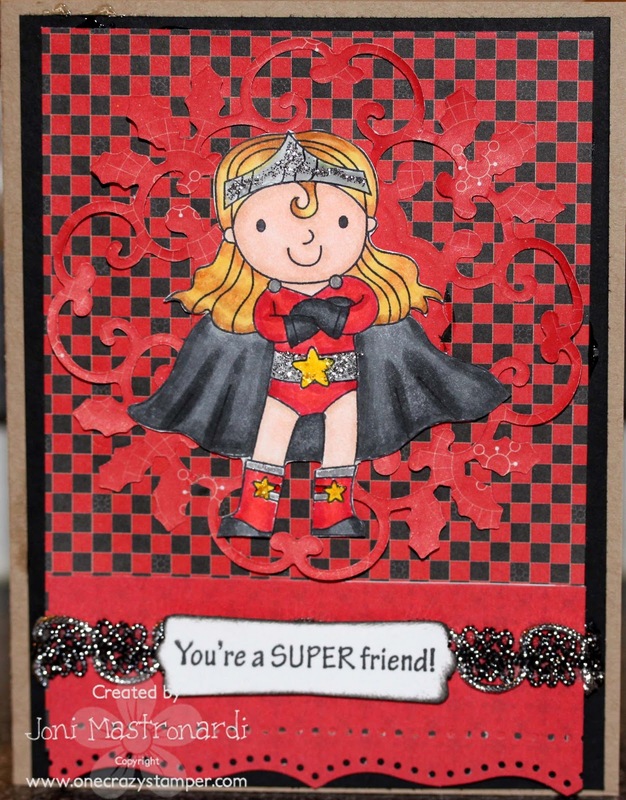 I stamped the "...Super friend" sentiment and popped that up on the trim. One Crazy Stamper has some awesome new releases. Check it out and don't forget to join in our monthly challenge at our One Crazy Stamper Blog! 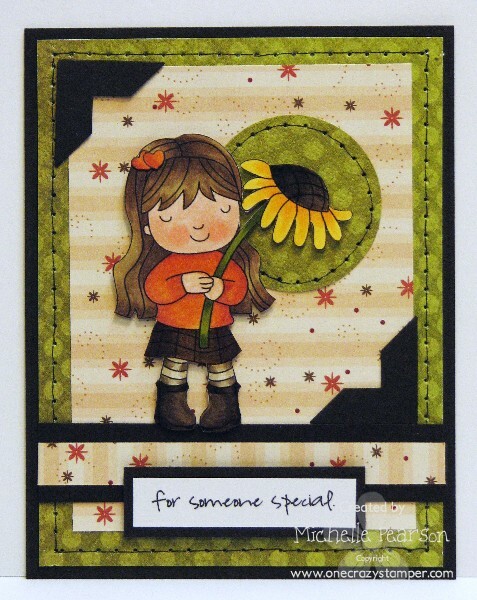 Hello it's my turn to share a card with you, this image is from the New Release from Your Next Stamp that was released this month. 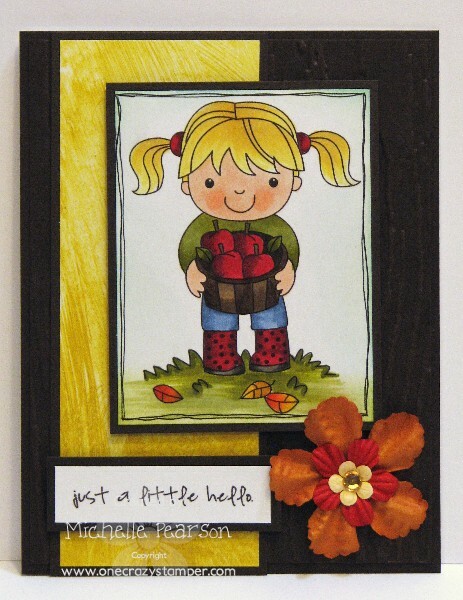 This image is called Autumn Harvest and the sentiment is included too. You can get it at the OCS online store. I colored this one with Copics, I added lots of glitter to the pumpkins and I love the look. Don't forget to enter this months challenge, there's still a couple days! Thanks for visiting!! Hi all, Madge here for another wonderful Wednesday at One Crazy Stamper. 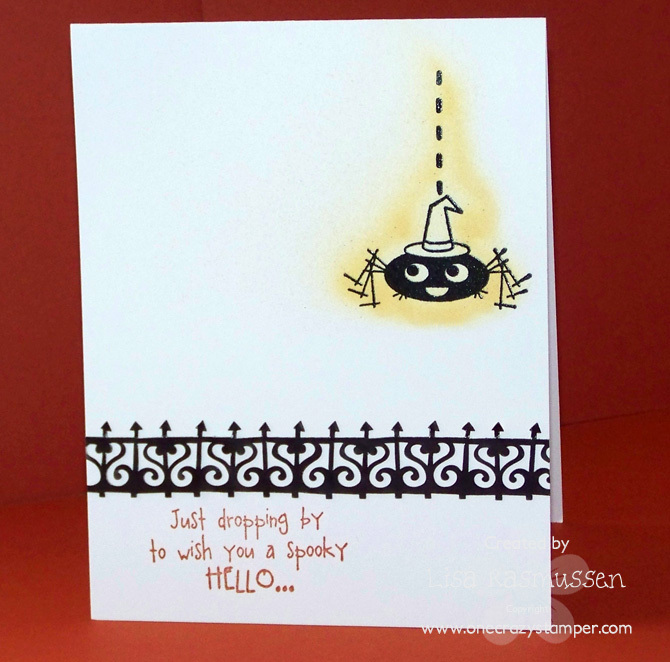 I just can’t get enough of the sweet Hallowe’en images from Your Next Stamp at One Crazy Stamper! They are just so darn cute! I’ve chosen Wicked Sweet for today’s card. I tore this card apart because it was photographing very dark – then I masked the image and sponged in the moon – it gave the gloomy papers just the right “pop”. Since I am out at the lake, I didn’t have a “stash” to dive into to change anything. OK back to the card. I stamped the image, colored it with copics……………assembled the card, then decided that it needed a big Yellow Harvest Moon…….. easier to do when the card is not assembled!! Then I shaded the white with Concord Distress Ink. The background paper is a brayered piece from 100 years ago…….. it fit in perfectly – the ribbon and brads are from my stash. Be sure to join in on the fun and prizes at One Crazy Stamper – free stuff is flying out of the store!! Coffee in my Bathrobe... Heaven! My papers are Echo Park Victoria Gardens. I love hot pink and orange together! I think I've been trying to get in as many bright colored cards as possible before the more somber tones of fall. 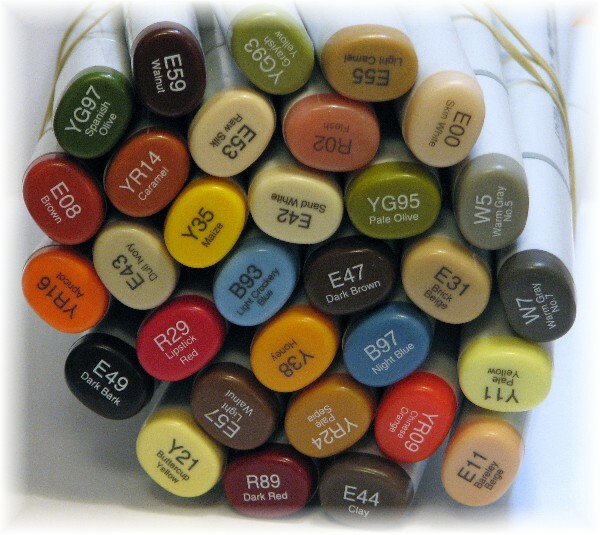 Although I do love a great fall palette also! Although she looks popped up, she isn't. That is shading added with the V91 and V93. Sorry, sometimes I forget to add some of the final colors to my list. I added it after my adding my "halo" around her with the YR's. Those tones blended too much with her skin so I needed to add something to make her "pop". Thanks for looking! Come back everyday to see all the amazing projects by my teamies!! I'm back to draw a winner for the HUGE blog candy celebrating One Crazy Stamper's brick and mortar store. If you didn't win this one there are still a few blog candies going on you can enter along our side bar. Also, you have a few more days to enter our September challenge and win a YNS prize pack!!! Without further ado...Our winner was chosen by random.org. Barbara please email me your mailing address at jacijangy at yahoo dot com to claim your prize. Thanks to all who joined in!! Hi Everyone. For my post today, I have used another YNS September Release called ApplePie Girl. I used the edge punch to create a border around the design paper and cross stitched this using Sew Easy Floss. for a chance to win one of the many free goodies that are available to celebrate the opening of the OCS brick and mortar store and receive the same great service as the online OCS store. Thank you to all who participated in this month's amazing celebrations for the Grand Opening of Lora's new brick and mortar store! 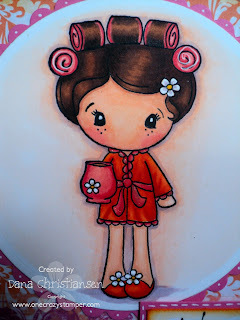 This stamp is the blog candy that I"m giving away on my September 18th post entitled "Ellie Loves Hot Cocoa"
I will forward your address to Jacilynn (DT co-ordinator) and Lora the owner of One Crazy Stamper. OCS and Mainlystamping Blog Candy! I love this super cute image from Your Next Stamp! It is called: Ellie Loves Sunflowers. I Love how cork looks so I have been trying to use it lately and it is SO easy to use! I was worried how it would punch and cut and it is easy-peasy! Ok so for the blog candy! Rules for the blog candy! 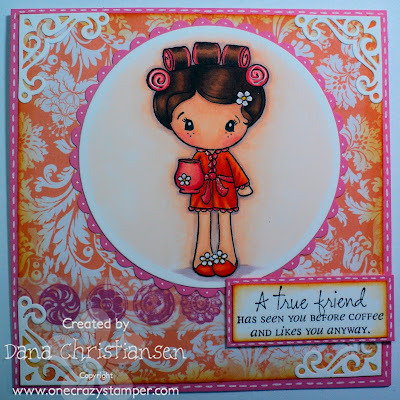 You have to be a follower of One Crazy Stamper Challenge Blog AND Mainly Stamping Blog. 2nd Chance: Have an entry in the September OCS Challenge on this post (YOUR CARD CAN BE FROM 9/1-9/30 AND DOES NOT HAVE TO BE A NEW CARD FROM THIS WEEK). Leave a comment with a link to your card. 4th Chance: Post a link to this blog candy on your blog and leave me a comment with a link to your blog. This can be in the sidebar or a post sharing this blog candy. 5th Chance: A Bonus comment just letting me know you are a follower on both blogs! I will chose 2 winners! 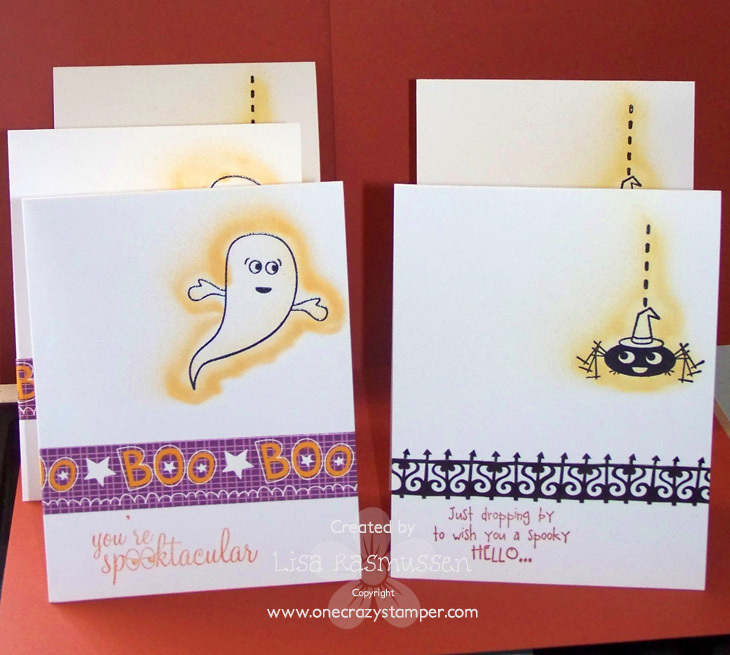 One winner will win the adorable stamp and the other winner will win the embellishment lot! 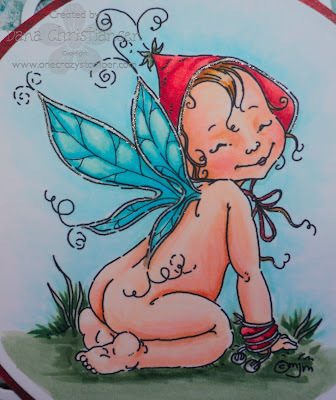 Today I have another new release from Your Next Stamps. The spider was cut from a punch and I added Ranger Stickles in black diamond. I distressed the white background with black ink. Spooky fence is also a punch. Products available from One Crazy Stamper. Hello Friends, hope you are all doing fine! I have a New card to share with you using this Sweet image from Belles and Whistles available at the OCS online Store, along with all your Belles and Whistles Favorites. This image is called Sweet Love, I colored the cute couple with Copics. 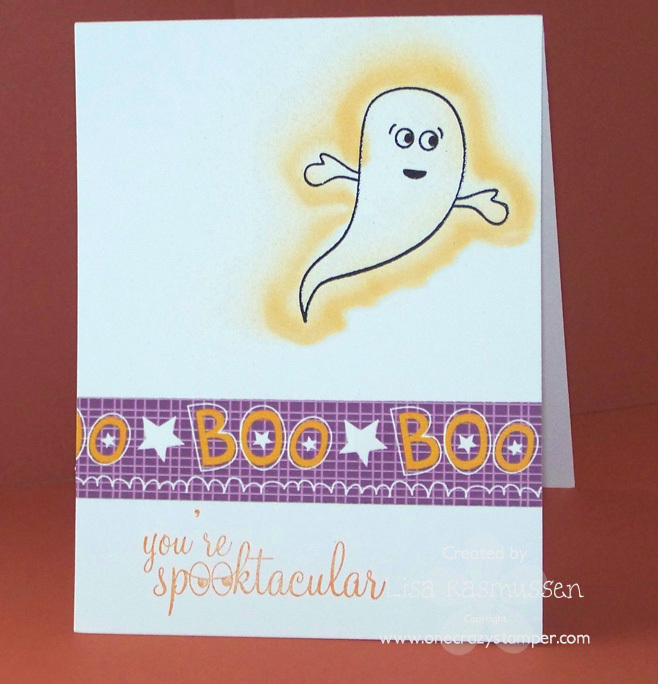 I used the Double Scallop Border Die from Whimsy Stamps available at OCS Online Shop to accent the right side of my card. Hi all, Madge here for another wonderful Wednesday. 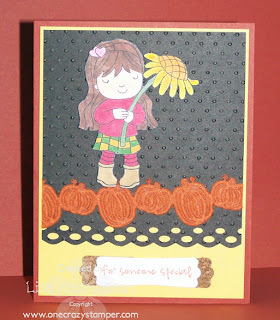 I have chosen stamps from YNS called Elle Loves Sunflowers and Autumn Harvest. These are available from OCS. 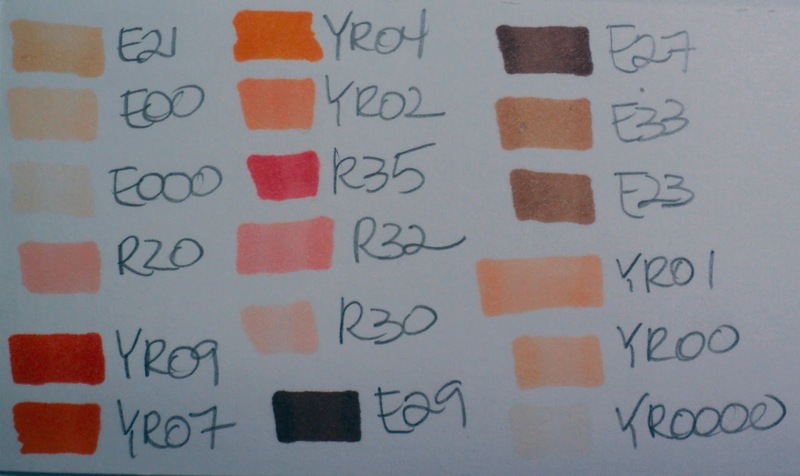 Supplies used: Copic Xpress It cardstock; Memento Tuxedo Black ink; Copic Markers; Spellbinders Labels 4; Distress inks (Spiced Marmalade); Copper Stickles; Glossy Accents and Misc. DP’s from Basic Grey and SU. Be sure to drop by the OCS blog for the challenge and enter your name into the drawing for oodles and oodles of free stuff – all to celebrate the opening of the OCS store with the same awesome service as the OCS online. I did use a Sakura Stardust pen to add those sparkly bits around her wings and hat. I never noticed before that her lil' hat looks like a strawberry, so that's why I went with the reds. My patterned papers are from Bo' Bunny. I think the only other touches are my Spellbinders and some flat back pearls. My sentiment is from Amy R of CC Designs. I don't see that particular set at the moment but LOTS of other cute ones to chose from!! 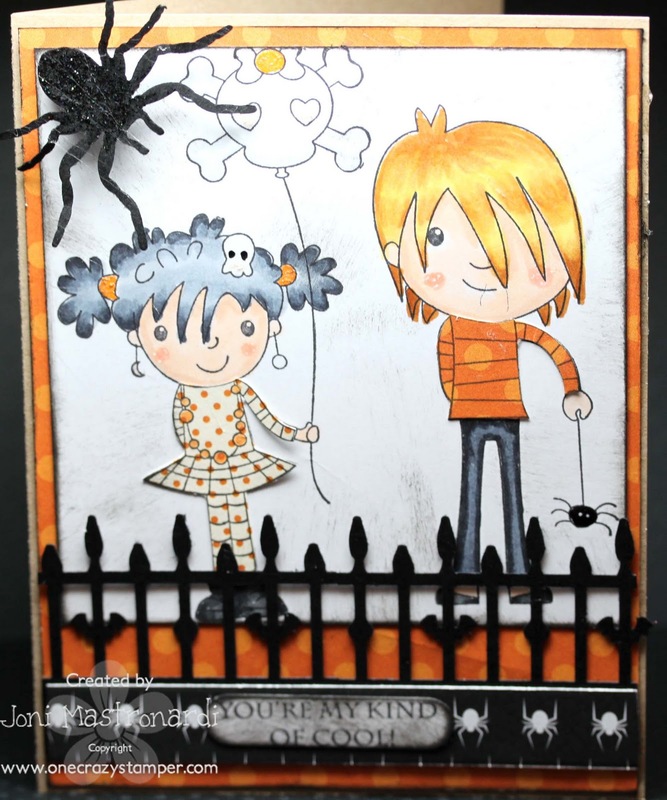 Your Next Stamp Card Trio and MASSIVE BLOG CANDY!! Today I'm sharing more of the September 2011 Your Next Stamp Release available at One Crazy Stamper! 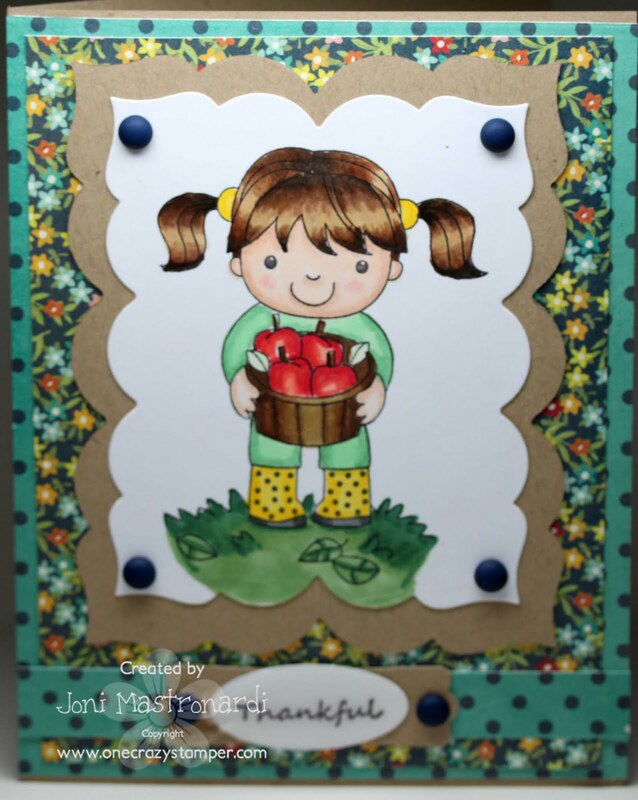 My first card features the Apple Pie Cutie set. You may not see it in the photo, but the Chocolate Truffle cardstock has been embossed with Tim Holtz's Sizzix Woodgrain embossing folder! Designer paper is from BasicGrey's Out of Print collection. 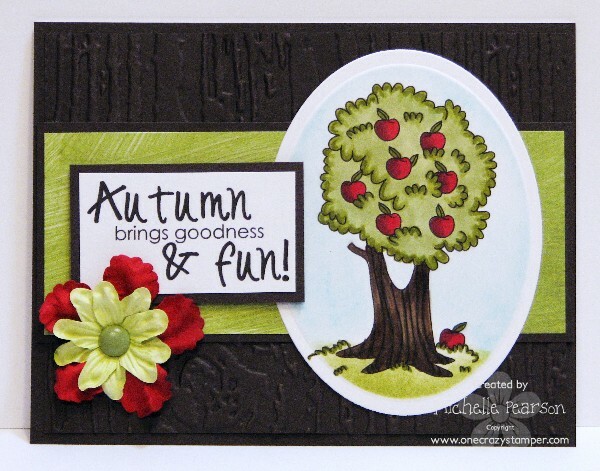 This card features the Apple Tree and Autumn Harvest set. I used the same woodgrain embossing and uses the same designer paper collection and cut out my image with a Spellbinders Oval Die. I distressed the sky and grass with Tim Holtz Distress Inks in Tumbled Glass and Peeled Paint. 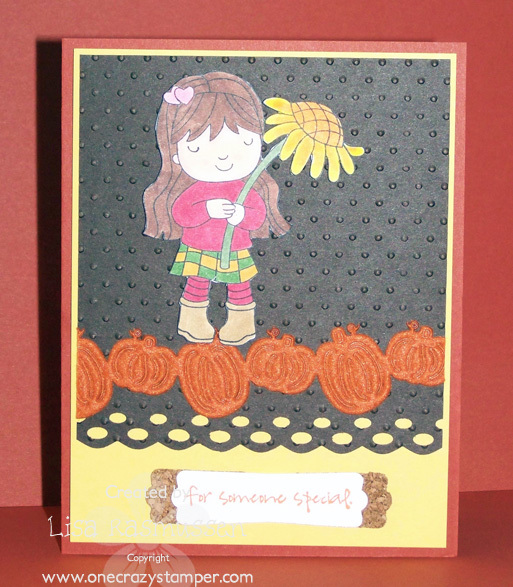 My last card features the Ellie Loves Sunflowers set. I used some designer paper by My Mind's Eye's Stella Collection as well as a misc scrap I found in my stash. I colored my card images with the Copic Markers shown below. Be sure you keep your eye on the One Crazy Stamper Facebook page and the design team member's blogs....there are giveaways celebrating the grand opening of the brick and mortar store, and you don't want to miss the GRAND OPENING CANDY WORTH $175! I will be selecting my candy winner from last Monday's One Crazy Stamper post tonight....so QUICK, enter while you may!!! 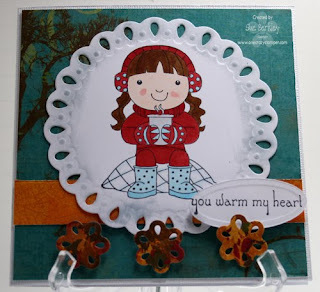 Hi Everyone , it's Sue here and for my regular Sunday post I have used Ellie Loves Hot Cocoa; another YNS from their fabulous September release. I also have some Blog Candy!!! There is still time to enter your card for this month's challenge to win a prize package from YNS. Supplies can be found at Lora's store One Crazy Stamper. Now, for some more amazing BLOG CANDY. September is definitely the month for some amazing prizes as the celebration of Lora's new brick and mortar store continues. 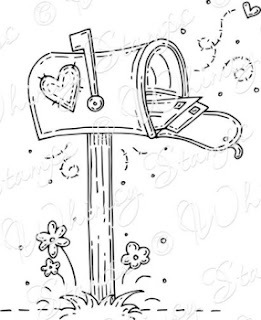 I have this cute Mailed with Love stamp from Whimsy Stamps as blog candy. Please leave a comment on my blog for each of the above (maximum of 3 comments per person) for your chance(s) to win! I will select a winner on September 25th and post the winner later in the day. Hi All! This has been a fabulous month to be a One Crazy Stamper follower!!! I have you seen all of the blog candy???? It is a blog candy bonanza! Make sure you join in on all of the fun to get your share of the goodies! OK so for my project I wanted to make clean and simple Halloween greetings. 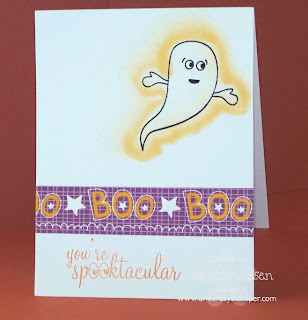 Clean and simple is not my strong suit and also one sheet cards are REALLY not my strong suit so I challenged myself to really try because I had this idea in my head since I saw these two stamps in the Your Next Stamp September release. I used Spooky Hello and Spooktacular. I used Versamark Ink to stamp the image and embossed with Black detail embossing powder. 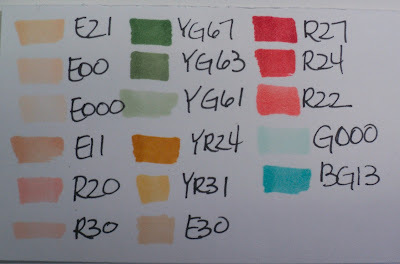 For some reason no matter what I do to the paper (embossing buddy, fabric sheet) I can never get the image as crisp as I would like.....there is always stray powder! Any suggestions? After I heat embossed I used the copic air compressor and airbrushed around each image and then stamped the saying in the bottom. I received this cool adhesive paper ribbon a long time ago but never used it so I thought I would break it out and use it here to give it a little something! Enjoy and make sure you have the deadlines for all the blog candy and their is still time to join in this months challenge HERE. I used the new Spellbinders label 23 to cut out and layer the focal image. Sentiment is also a YNS September release: Life is Great. DP is Crate Paper Farmhouse. 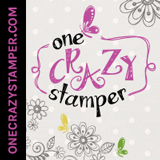 All supplies are available at One Crazy Stamper. Check out my blog for some blog candy. Also blog candy on the OCS blog. 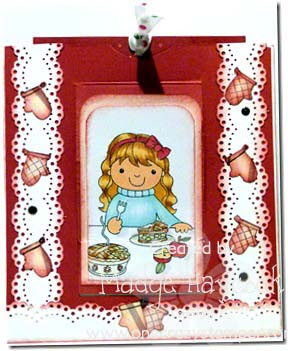 Hello I hope you are enjoying your week, I have a New card to share with you using the stamp Apple Pie Cutie from the New September Stamp release from Your Next Stamp. I colored this image with Copic Markers, I also used the Double Scallop Border Die from Whimsy Stamps available at OCS. Autumn is one of my favorite times of the year – the colors, the smells, the abundance of sweet, juicy, crisp Okanagan APPLES – mmmmmmm. I’ve chosen a sweet little stamp set called Life is Great (aka: Apple Pie Girl) – from YNS available at One Crazy Stamper The image was stamped onto Xpress-It Blend cardstock with Memento Tuxedo Black ink and colored with Copic markers. I chose to do a “pull tab” card, (measuring 5” x 5 1/2”) which is a fun card for such a fun little image. The oven mitts, (and sentiment)are part of the stamp set and were stamped onto double sided paper. To get the opposite mitt, I cut the mitts out then flipped them over. The dots, were a mistake – They are the hot glue / metal discs (I forget the name of them, but as soon as I put one down, I knew that there was no going back. The Martha Stewart punched borders were sponged with Fired Brick, along with the oven mitts. DP is from stash. Hope you enjoy my little “Apple Pie Girl” and will join in on the OCS Celebration challenge to win prizes galore! Got Candy? and a GIVEAWAY!!! 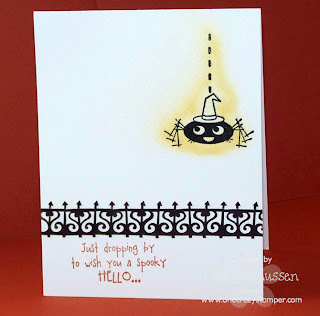 Your Next Stamp NEW RELEASE SPOTLIGHT!!! September Guest Designer Willemein K.